Who Do You Say That I AM? 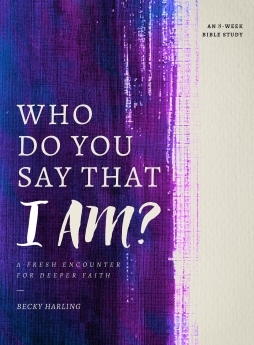 : A Fresh Encounter for Deeper Faith by Becky Harling is an eight-week Bible study reflecting on the “I am” statements of Jesus found throughout the Gospels. Becky Harling is a pastor’s wife and women’s speaker with a degree in Biblical Literature. Becky has survived both breast cancer and sexual assault, and uses her personal stories as a message of hope and healing. This Bible study is eight weeks long, and each week is broken up into five days. This study can be done individually or as a group, and is great for women of all ages in all walks of life. I did one week a night, since some of the days are pretty short, and really enjoyed it! I wrote in a notebook instead of the book in case I ever want to do this study again (I’m pretty sure I will want to do it again next year!). Each week has sections titled: Explore (where you make observations of the verses or chapter you just read), Reflect (where you answer questions about the verses you just read, or reflect on your personal growth), a memory verse, and a praise section that includes a song to look up and listen to. Each day opens up with a quote, then some story from Becky about herself or someone she knows. I really enjoyed reading some of the stories and hearing how God worked in other people’s lives. I was also introduced to a lot of new songs with the praise section. This is the first Bible study I’ve done by Moody Publishers. I’m looking forward to checking out the others they have to offer. Have you done any of their studies? Which one is your favorite?